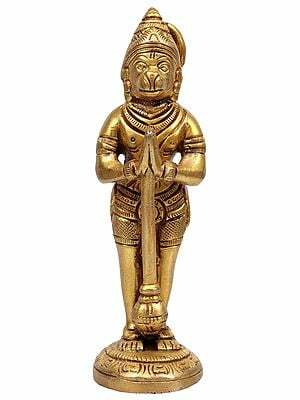 4.3" X 12.0" X 2.2"
This brass statue of the monkey-god Hanuman is an excellent work of metal-craftsmanship. It represents Hanuman as resting lying on his right side with a large size splendid bolster, besides his right arm, supporting his head. Clad in a loincloth and a sash and adorned with a crown and few ornaments on his chest, arms and feet the image of Hanuman has been conceived as reclining on a plain narrow bed laid over a lotus base. In the entire Hanuman mythology or body of scriptures, this servant of Rama – always on vigil and never known to rest, is alluded to have reclined only once, barring a casual mention here or there, and that too, not without a purpose. By pretending to be lying down mid-way he wanted to strip mighty Bhima, Pandu’s second son in the Mahabharata, of his vain ego which could plunge him into a harm or misfortune and thus the result of the Great War could be different and the objective of Hanuman’s Master Rama, in his form as Krishna, defeated. 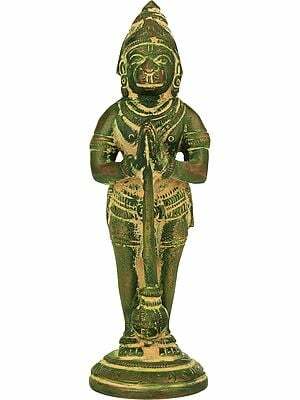 In agreement to such perception of Hanuman, the artist of this rare piece has taken care to suggestively portray, simultaneous to his reclining posture, also this spirit of vigilance and service, the core of Hanuman’s being. While representing him as reclining, the artist seems to have had in mind that Hanuman’s grip on his weapon – club, was not loosened. With a thoughtful face which reveals an alert mind and a hand ready to strike a foe here is a Hanuman wide-awake, even in a reclining body-frame, and fully alert to a call and to act on it, something which is the most characteristic feature of Hanuman’s theology that perceives him as ‘Sankata-mochana’ – one who redeems from crisis anyone who calls him even once. Chapter 37 of the Vana-parva in the epic Mahabharata illustrates in details an episode which portrays Hanuman as lying reclining across a passage covering its entire breadth with the intention to block Bhima’s way for correcting him. Before the Great War, on the advice of Lord Krishna, Arjuna had gone to ‘Swarga’ – Heaven, for obtaining gods’ celestial weapons. His return was, however, delayed far beyond the schedule. Hence, out of anxiety Pandavas set out to ‘Swarga’ in Arjuna’s search. When close to Gandhamadana Mountain, winds brought to Draupadi, strolling around with Bhima, a beautiful sweet fragrance-emitting lotus. Bewitched by its beauty and fragrance Draupadi asked Bhima to bring to her some more of them, which she would present to Yudhistara. To please her Bhima set out in the direction from where the sweet perfumed breeze was flowing. A little ahead, Bhima found a monkey, old and feeble, lying across the path. Words were exchanged and vain Bhima even threatened the monkey but the monkey did not get up from where he was reclining. He prayed Bhima that being old and weak he was unable to move and suggested that he could put aside his tail and pass. Bhima tried over and again to lift the monkey’s tail but without success. Bhima immediately realised his error as also that the monkey was no other than Hanuman, his elder brother, preceding him in his lineage from the Sun-god Surya.